Perhaps if you are a little less adventurous and less keen on the task of assembling your own supplies needed in order to age your own spirits, you can invest in one of our own bootleg kits. We have several different bootleg kits available, all of which include almost all the supplies you will need in order to age your very own spirits. 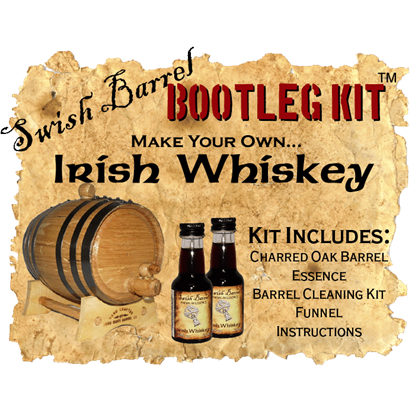 Each bootleg kit includes a charred oak barrel made from American white oak, a simple wooden stand, a bung, and a wooden spigot, as well as bottles of flavored essence, a barrel cleaning kit, one funnel, and a set of easy-to-follow instructions. In fact, the only thing not included in our bootleg kits is the actual alcohol. We leave it to you to acquire that. We offer our bootleg kits in various volumes. Per each flavor, we offer a 1, 2, 3, and a 5 liter kit. And we offer a variety of tasty choices, ranging from a variety of classic rums, including spiced rum, dark Jamaican rum, and amber Caribbean rum, to various other aged liquors, including mead, Irish whiskey, orange brandy, and wild bourbon whiskey. And these are just some of the various flavors we offer in our bootleg kits. So if you are tired of the traditional spirits, or if you want to try your hand at flavoring and aging your own personal brews, give our bootleg kits a try. You might just find that you like the home-brew better than the store-bought. Make your own Amber Caribbean Rum with our very own bootleg kit. A special golden colored blend of barrel-aged reserve rums distilled from premium West Indies sugar cane, this 1 liter kit is a must for any thirsty Pirate! 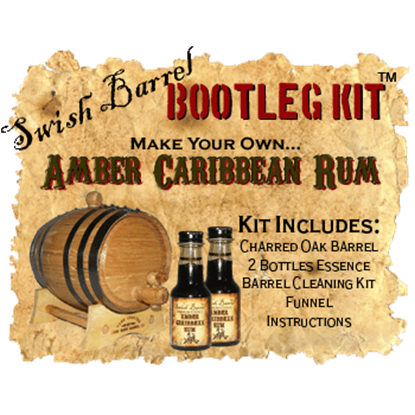 Make your own Amber Caribbean Rum with our very own bootleg kit. A special golden colored blend of barrel-aged reserve rums distilled from premium West Indies sugar cane, this 2 liter kit is a must for any thirsty Pirate! Make your own Amber Caribbean Rum with our very own bootleg kit. A special golden colored blend of barrel-aged reserve rums distilled from premium West Indies sugar cane, this 5 liter kit is a must for any thirsty Pirate! Make your own Dark Jamaican Rum with our very own bootleg kit. This one liter barrel kit allows you to create a special golden colored blend of barrel-aged reserve rum distilled from premium West Indies sugar cane. Make your own Dark Jamaican Rum with our very own bootleg kit. This two liter barrel kit allows you to create a special golden colored blend of barrel-aged reserve rum distilled from premium West Indies sugar cane. 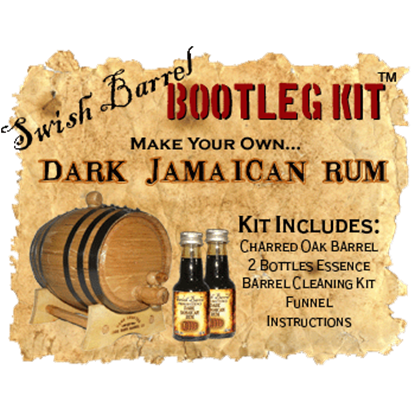 Make your own Dark Jamaican Rum with our very own bootleg kit. This five liter barrel kit allows you to create a special golden colored blend of barrel-aged reserve rum distilled from premium West Indies sugar cane. 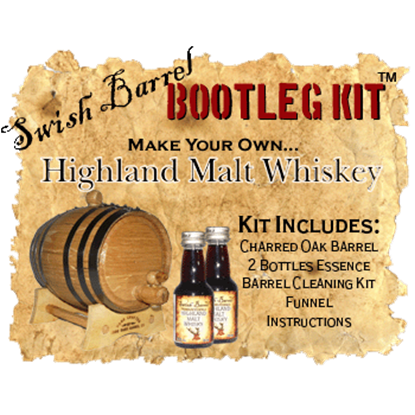 Make your own Highland Malt Scotch Whiskey with our very own bootleg kit. This 1 liter kit recreates a full flavored smoky single malt style whisky, made using pure Scottish spring water and peated barley since the 15th century. Make your own Highland Malt Scotch Whiskey with our very own bootleg kit. This 2 liter kit recreates a full flavored smoky single malt style whisky, made using pure Scottish spring water and peated barley since the 15th century. Make your own Highland Malt Scotch Whiskey with our very own bootleg kit. This 5 liter kit recreates a full flavored smoky single malt style whisky, made using pure Scottish spring water and peated barley since the 15th century. A bootleg kit is perfect for the full time re-enactor who likes to do things the old way. Now you can make your own Irish Whiskey, aka the Ulsce Beatha (Gaelic whiskey), aka the water of life, with our very own 1 liter Bootleg Kit. A bootleg kit is perfect for the full time re-enactor who likes to do things the old way. Now you can make your own Irish Whiskey, aka the Ulsce Beatha (Gaelic whiskey), aka the water of life, with our very own 2 liter Bootleg Kit. A bootleg kit is perfect for the full time re-enactor who likes to do things the old way. Now you can make your own Irish Whiskey, aka the Ulsce Beatha (Gaelic whiskey), aka the water of life, with our very own 5 liter Bootleg Kit.